or weeks to see a Doctor? Our Partner, MDLIVE is a non-emergency medical service, available 24/7/365, that connects your family with more than 2,700 board certified, licensed physicians with an average of 10 years experience, that can diagnose, treat and provide prescriptions for non-narcotic/non-DEA/non-state-controlled substances to you and your family members. You no longer have to sit in germ infected waiting rooms or wait to get a doctors appointment just to get care or prescriptions. With It’sUrgent.com you get care in as little as 10 minutes, via a simple phone call or video conference. As a HealthNetwork consumer, you are being provided with access to the very best TeleMed services available within the USA, at a cost that is not matched or beaten anywhere else. Finding affordable health insurance is challenging enough, but being able to quickly get an appointment to see a doctor, that’s even more difficult. Thankfully, most of the time we end up using our health insurance to see doctors for more common reasons. Often to get treatment for allergies, cold and flu, sinus infections, skin conditions, general testing and annual check ups. Sometimes it can take up to two or three weeks to obtain an appointment to see your general medicine doctor, and weeks more to get a referral to a specialist. We’re doing something about that. WHAT IF YOU COULD SKIP TO THE FRONT OF THE LINE? Thankfully we have a better option, one that allows you to consult with a doctor in minutes, not days or weeks. Telemedicine is becoming more and more popular with individuals as a way to handle and resolve the most common reasons why we end up at the doctors in the first place. In fact, its popularity with families with young children is growing at record levels across the United States. ItsUrgent Telemed Service is a way for you to consult and receive treatment from a board certified (USA based) doctor, in the convenience of your living room. It is almost like how it used to be, when doctors came to you, and you didn’t have to spend two hours in a waiting room. 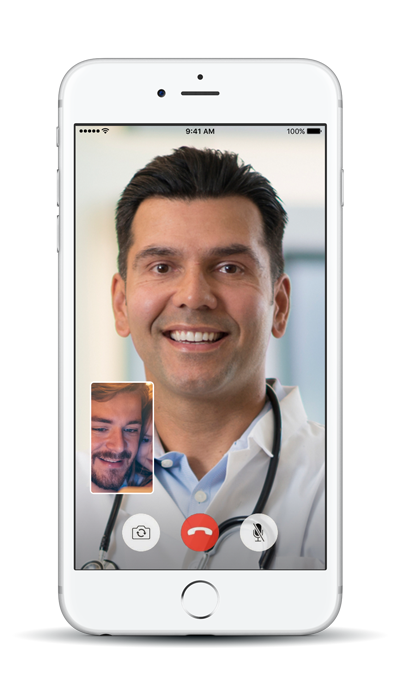 With ItsUrgent you will be able to video conference with a doctor, or if you don’t have the ability to video conference, you can simply speak with the doctor over the phone. It is not unlike going to the doctor in person, and depending on the circumstances, the doctor will prescribe a treatment and prescription medication, or the doctor can provide you with a referral to a specialist should you require one. ItsUrgent provides you with access to great board certified doctors immediately, and thanks to HealthNetwork, at a price that is not available anywhere else. Typically similar services cost upward of $80 per session. Because you are a HealthNetwork member, you and everyone in your household are receiving access to ItsUrgent Telemed services at only $10 per month. We know, you’re thinking, “this sounds too good to be true”. We get it, we have been let down before, so your skepticism is understandable. So as a way to help you give ItsUrgent a shot, HealthNetwork is giving you 30 days free to try it out. If you are not happy with the services and doctors provided to you by ItsUrgent and HealthNetwork, cancel your membership within the first 30 days and you will not be charged anything. If you find that ItsUrgent is in fact a much better way to get access to doctors quickly then keep the service and you will only be billed $10 per month. Are you wondering how this is possible? It’s because HealthNetwork wants to help make healthcare easier to understand, easier to afford, and overall a much better experience when seeking treatment. HealthNetwork helps more than 17 million American’s annually obtain access to health insurance, providing affordable access to ItsUrgent doctors is just one of the ways in which it can give back to its members. Our Partner, MDLIVE is a non-emergency medical service, available 24/7/365, that connects your family with a nationwide group of licensed physicians that can diagnose, treat and provide prescriptions for non-narcotic/non-DEA/non-state-controlled substances. I didn't need to spend hours setting in a germ infested waiting room. I talked to a doctor and was diagnosed right on the phone. Even though I needed care in the middle of the night. I used Tele-Medicine and got help immediately. My Daughter was suffering from horrible allergies. A quick phone call later, she was prescribed medicine within minutes. If the Doctor determines that you need prescription medication, the script for the needed medicine is transferred to any pharmacy of your choice within the USA. Once you sign up, you will also receive immediate access to the HealthNetwork prescription Discount Card that allows you to save significantly on almost all prescription medications. Our pharmacy network includes more than 64,000 pharmacies, and includes all major retail pharmacies and most independently operated pharmacies. You can save up to 80% off your prescription drug costs with our savings card. Our network includes major pharmacy retailers like Walgreens, CVS, Walmart, Rite Aid, Kroger, Target, Duane Reade, Publix, and many more.